Islands are the focal and social point of many kitchens. In our opinion they don't always get shown enough love. So to inspire you, it's time for an island-hopping adventure. There's plenty space for more than one person to work in this kitchen at the same time. This space doubles as a test kitchen for a newly established catering company. There are two work surfaces – a long island benchtop and another under the window with two sinks for food preparation and serving. This creates two work triangles: a preparation triangle between the full-height cabinets and the island, and a second triangle for cooking further along. As a result, there is ample space for more than one person to work in this kitchen at the same time. 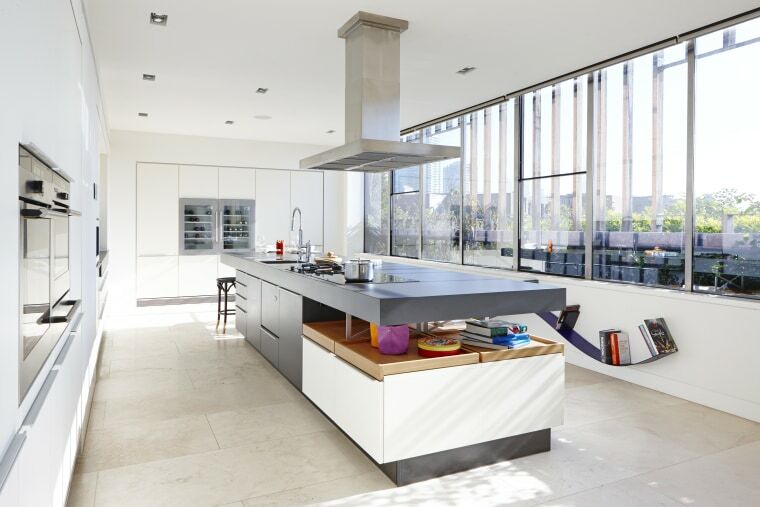 Integrated appliances help the kitchen maintain a slick, pared back look. Under-counter storage on this island reduces the need for overhead cabinets. This is an immersive kitchen space – standing at the island, you feel you're part of the wider environment. Appropriate to its natural setting, the kitchen has an eco-friendly makeup. 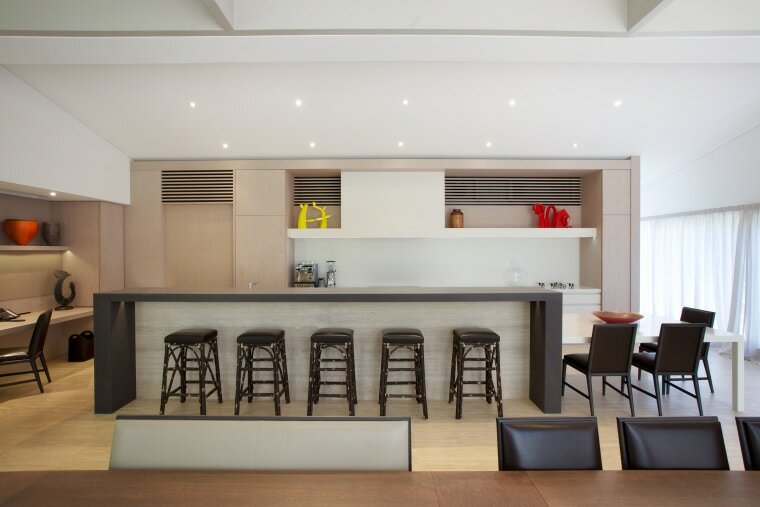 The granite used on the benchtops is a similar tone to the recycled elm used on the floor and walls. Under-counter storage on the island reduces the need for overhead cabinets. This optimises visual corridors and light penetration across the space. The island serves the owner's request for a futuristic kitchen that would complement their modern, high-tech home. 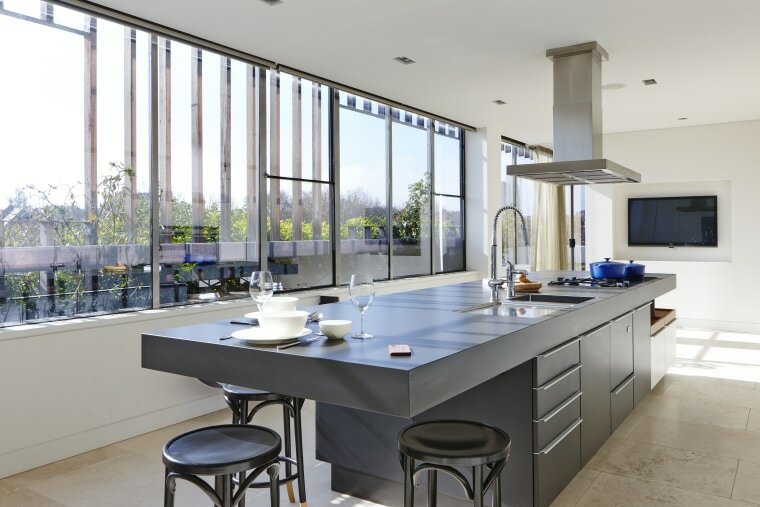 The owners of this home asked designer Kira Gray of Fyfe Kitchens for a futuristic kitchen that would complement their modern, high-tech home and cater to their love of entertaining. It required three defined areas that would serve specific purposes – the main kitchen, a scullery and a bar area. 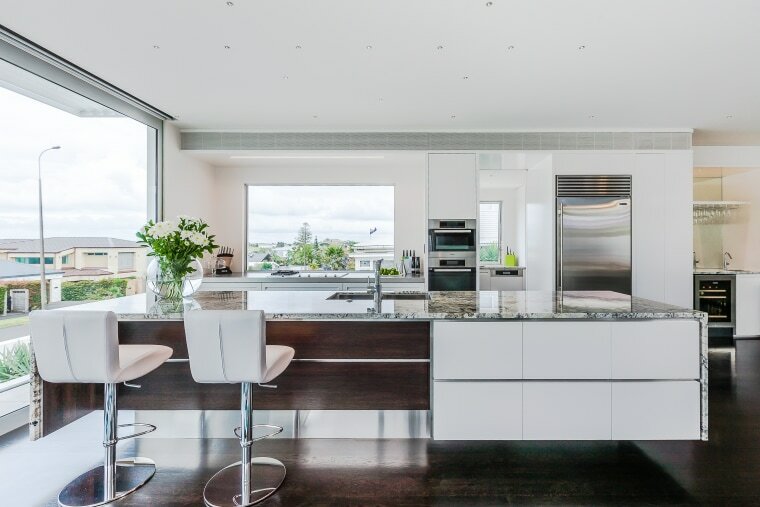 The waterfall granite benchtop on the cantilevered island is the hero of the main kitchen. The highly textural granite also features in the adjacent bar area. A deep stainless steel toekick and negative detailing enhance the sleek, floating look of the island. Ample work and storage space are two advantages of this island. The 4.6m-long island in this Poggenpohl kitchen has a continuous high-pressure laminate worktop that provides ample space for food preparation and serving, as well as open storage. As one continuous surface, it adds to the visual drama of the kitchen. The other end of the island has space for guests to sit and chat. 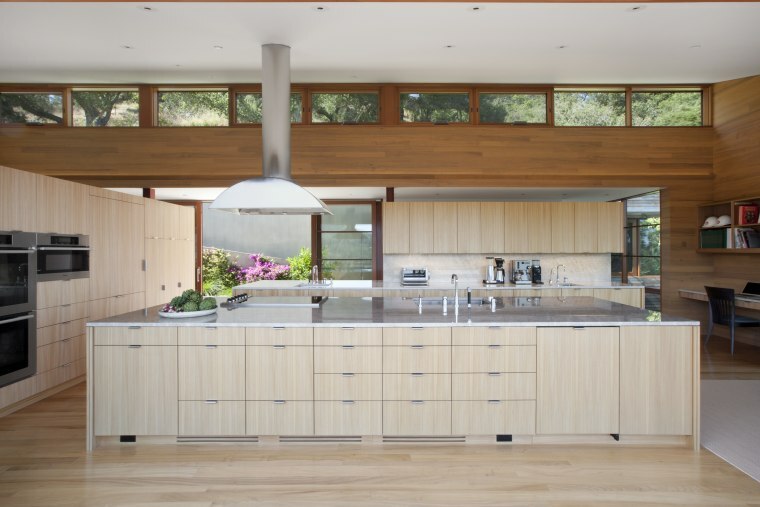 The island's other cantilevered end forms a place for guests to perch while meals are prepared. Both the cooktop and main sink are on the island. Because the owners are devotees of Asian and fusion cooking, the cooktop incorporates a powerful wok burner and an induction hob. 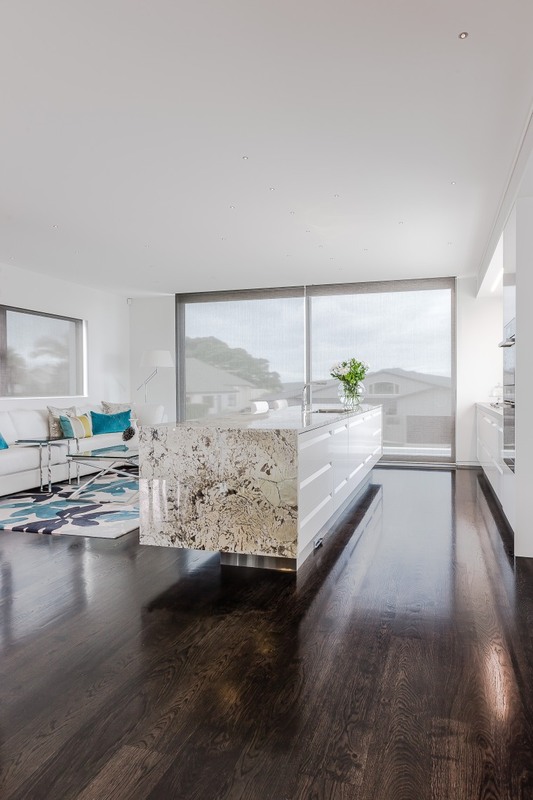 White marble contrasts the dark timber on this island. This renovated apartment's kitchen and utility cupboards were designed to provide a continuous, flowing backdrop to the living spaces. The dark timber echoes the trunks of the acacia trees outside the window and creates a dramatic contrast to the white walls and ceilings. 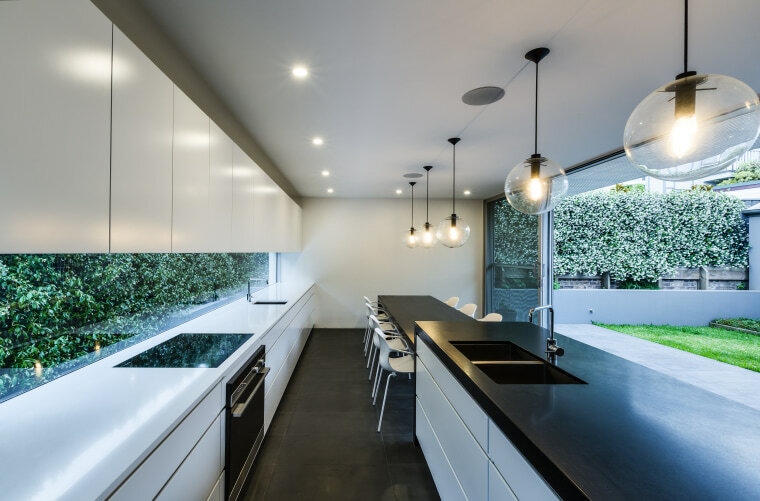 White marble contrasts the dark timber on the island in this contemporary apartment kitchen. 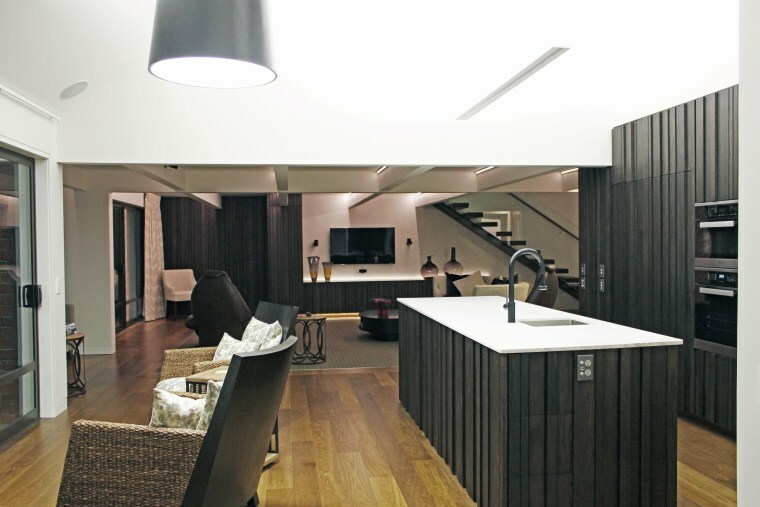 Visual continuity is also provided by similar timber cabinetry in the living area. A new bay window and a large skylight provide extra natural light, further play on the contrast of light and dark. This kitchen's long island is extended further by an additional table at the end, providing more than enough seating for guests while the owner cooks. The worldly owner of this home enjoys entertaining in the kitchen, opting for a sophisticated look. Designer Leon House employed high-end materials with a quiet finish reflect the design brief – dismissing many options that were too loud or busy. Solid Romano Italian travertine features on the floor throughout the living area. It wraps up the front of the long island, which is extended further by an additional table at the end. This provides more than enough seating for guests while the owner cooks. The travertine is teamed with white Corian cabinets and a textural charcoal stone on the island. This was flamed and brushed to contrast the sleek finish of the Corian.